I recently wrote a post on Tools and Diagnostics for Office 365 and referenced about the Ignite webcast " Diagnostics in Office 365, Technical Support Webcast" scheduled yesterday and I got a chance to attend this great webcast and found it really useful to visually see few new innovations with O365 Diagnostics demonstrated by presenter Jermey Hayes MSFT. During the session Jermey presented few important diagnostic tools available from Microsoft team to identify the common issues like MOSDAL, EXRCA etc. and also showed us how the O365 Admin portal is enhanced for submitting support cases wherein now it provides appropriate solutions for an issue when you start to submit the case in first place with required resources to make the Admin himself resolve the issue if possible before approaching the support and also discussed on few other vital topics. The most important one to consider is the "Office 365 Readiness Wizard" where Jermey explained its significance and showed a real demo for audience, over which I wrote this post here today. 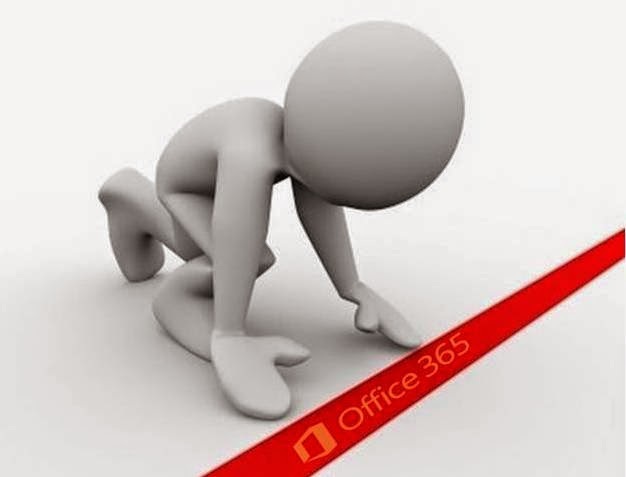 This Office 365 Readiness Wizard is a great tool which runs from the O365 Portal and collects vital information about the Environment automatically and analyzes it and provides you the result whether your Environment is ready to move to O365 or not. Tool lists the potential requirements and issues that needs to be addressed before you take the migration path effectively. When you start the test you two modes to execute one is for Basic tests and the other one is the Advanced test which is recommended one for Hybrid deployment to Analyze the complete environment and make sure we are ready to move on. Jermey said at present the Tool runs only on IE with the latest version and soon the Other browsers will be supported and no ETA on this as of now, which is a pain point as we need to get a PC arranged with the stated requirements before we execute the Tool. Below is the warning you will receive when you execute the Tool from a machine that does not meet the requirements. 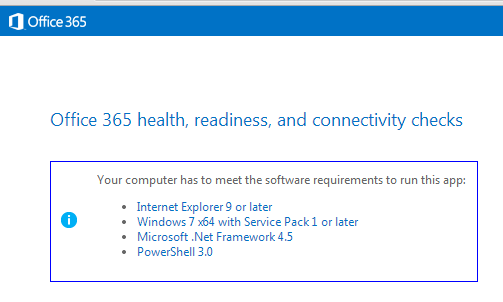 I requested Jermey to answer my question on using the Tool on a already deployed O365 Environment and he responded a big "YES" that we can run this Tool on an existing Environment which will run the checks and provides us a detailed report on how things are set now and also shows us if there are any issues that are beyond our eyes to make it addressed at the right time. I am in the progress of organizing a Machine which meets the Tool's requirements and will soon be running the test on my Hybrid Exchange Environment to see the status. I wrote this post today to share the same with you so that you can schedule sometime to run this Tool on your Environment and see how things are setup and take necessary action. * Take a quick preview on how to run this Tool and how it shows the results through the below recent post from our MVP Prabhat Nigam on his Msexchangeguru website. Also I suggested Jermey on updating the O365 Dashboard page Resources section with the link to "Tools and Diagnostics" web page available in the Community forum which will be a great add-on for Admins to know the tools available for Troubleshooting various issues with O365 and he took that suggestion and promised that he will discuss with the product team and I believe we can soon get it available. If you missed to attend this session not to worry, soon the Presentation Slides and Recording will be made available and you can access it through the same Ignite webcast event page referenced and get to know things better visually.